Do you believe in levitation? Spend some time with Q Acoustics Concept 300 and you might. These bigger-than-your-average bookshelf speakers deliver dynamic, detailed, wide-open performances rivaling competitors several times their size in a fashion that will raise the hairs on the back of your neck. And that’s not the only feature that will set your spidey sense tingling: The Concept 300 make an architectural statement even while perfectly silent, thanks to their ingeniously designed stands. These speakers will look right at home in a sleek, modern living space resplendent with low-slung furniture, floor-to-ceiling windows, and buffed wood floors. Just kidding. They also made an impression in the plaster-walled family room of my 170-year-old urban dwelling. 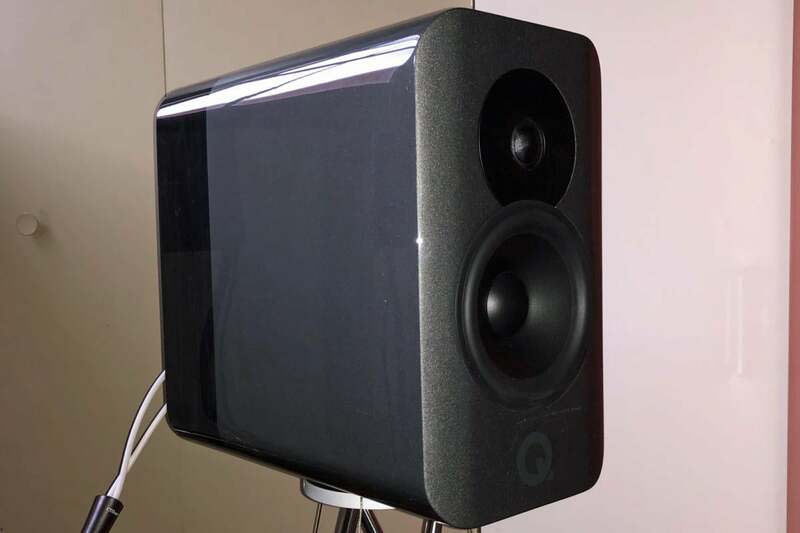 The Concept 300 look like typical two-way bookshelf speakers from the front, measuring 8.6 inches wide and 14 inches high. View them in profile, however, and they look anything but typical—stretching back 15.75 inches in depth. My two-tone review units came in a high-gloss silver finish with an ebony wood veneer accent at the rear. You can order yours in that finish, black with rosewood veneer, or white with oak veneer. The extreme proximity of the Concept 300’s tweeter and mid-range/woofer result in a seamless frequency crossover. 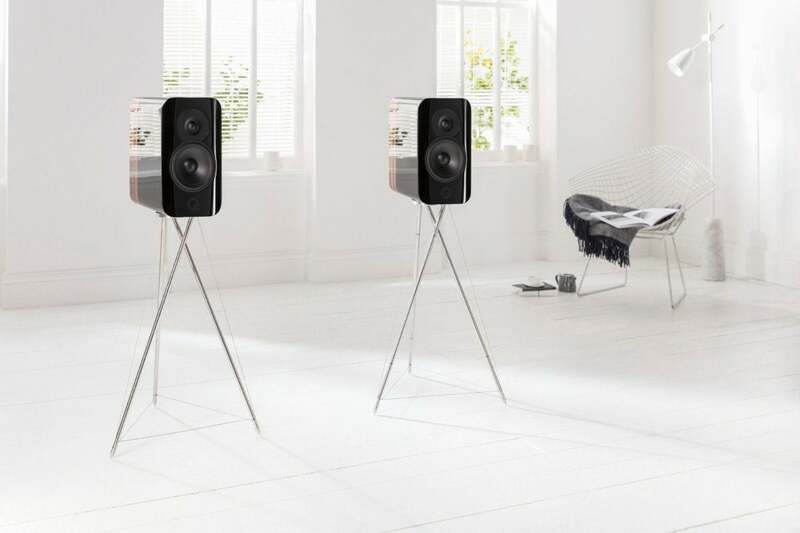 Q Acoustics’ Tensegrity speaker stands—included in the speakers’ $4,499-for-the-pair price tag—are boxed separately and arrive pre-assembled. That’s a good thing, as the stands’ industrial-looking construction is like nothing I’ve encountered: Tripods with stainless steel legs held in place by vertical and—at the base—horizontal steel guy wires. Famed architect Buckminster Fuller introduced this lightweight load-bearing design as a huge outdoor sculptural installation in early 1950s London. Q Acoustics has shrunk the concept to a 28-inch-high construct that likewise offers strength without much mass. More importantly, the design impeccably isolates the stands from the speakers, so they don’t contaminate the speakers’ sonic reproduction by resonating in sympathy with the cabinets they’re supporting. A spring-loaded suspension system hidden inside the bottom of each speaker couples to the stands and contributes to that isolation. Visually, the speakers—housing tightly aligned wide-dispersion drivers (1.1-inch dome tweeters and 6.5-inch mid/bass) and a carefully calculated crossover—seem to float about their stands. All this, combined with less-is-more enclosure bracing inside the MDF cabinet walls, and polyurethane elastomer sandwiched in layers between the cabinet walls, contributes to the sense that the music itself is floating all around the Concept 300. The Concept 300 are wired for bi-amping, although I did not test them that way. Bolts tighten the mounting bracket panel to the enclosure to eliminate any whiff of vibration between the two materials. The suspension system offers a secondary benefit that Q Acoustics doesn’t bring up at all: Should someone brush up against one of the enclosures, the speaker will rock a bit, but the stand beneath will remain rock steady—despite the latter component’s light weight (8 pounds, 10 ounces). Q Acoustics says this three-legged creature will sit more securely on uneven flooring than any four-legged stand. 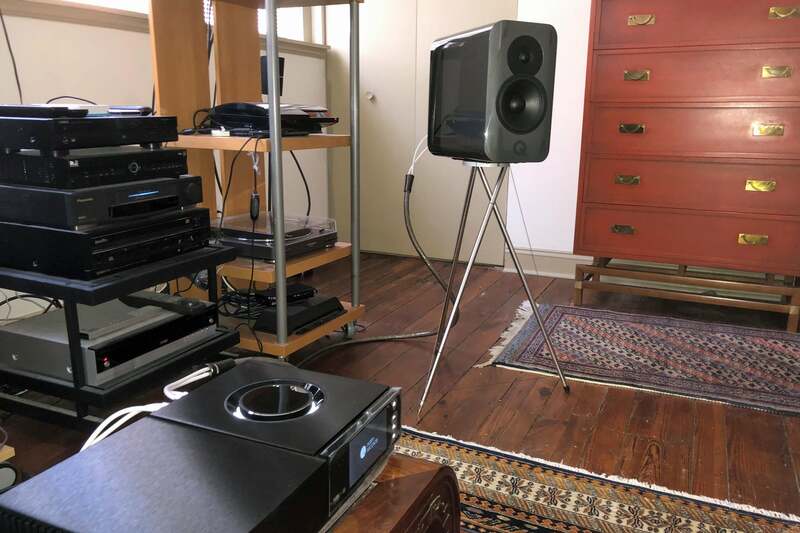 While the highly efficient (90dB sensitivity) Concept 300 can put out prodigious amounts of sound with a minimum of just 25 watts of amplification, I jumped at an invitation to test the pair with Naim’s Uniti Nova, an all-in-one audio streamer with a Class A/B integrated amplifier that delivers 80 watts per channel. With the Uniti Nova connected to my home network, I was able stream a range of internet radio stations as well as tunes from Spotify and—in 44kHz/16-bit FLAC—music from Tidal Hi-Fi. From the dazzle of Rimsky Korsakov’s “Scheherazade” and Andre Bocelli wailing “Ave Maria” on Classic FM London, to the thumping dance beats and room-rocking bass of Deep Vibes Radio. Wow! Percussion comes alive on these speakers! Tuned to Tidal, the Concept 300 put me in a first-row seat in Venice for Keith Jarrett’s grand piano improv set La Fenice. The speakers revealed Jarrett’s deft touch, theatrical foot-pedal stomping, and the inner mechanical rumblings of his instrument. Another treat was hearing Joni 75: A Birthday Celebration, on which song stylists Rufus Wainwright, Diana Krall, Brandi Carlisle, Seal, and other artists share what they’ve learned from legendary singer/songwriter Joni Mitchell. Even more telling, personally, was hearing the Concept 300’s decoding of my desert-island-favorite double album from Derek & The Dominos, Layla and Other Assorted Love Songs. The speakers did a masterful job of de-sludging the Miami studio mash-ups of Eric Clapton, Duane Allman, and friends. The Concept 300 sit pretty atop their Tensegrity stands. 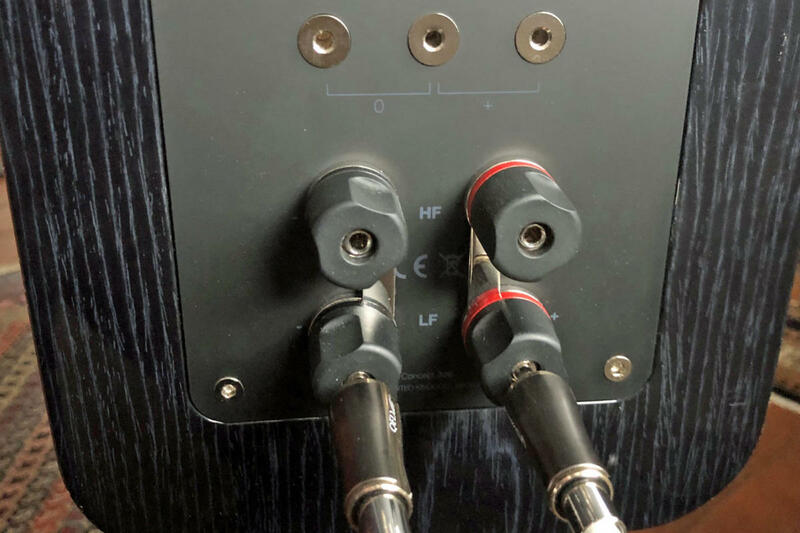 Just don’t forget how exposed your speaker cables will be (I used QED Supreme Custom Cables in my evaluation). But be warned: The Concept 300 will expose every flaw in lower-resolution and/or poorly miked recordings, a reality I discovered while listening to tracks streamed via Bluetooth from a smartphone by way of the Uniti Nova, and cuts from the 20th-anniversary edition of Now That’s What I Call Music on a CD played on the recently reviewed Panasonic DP-UB9000 4K Ultra HD Blu-ray player. At lower volume levels, that keeping-it-real intent can make these speakers seem almost too restrained and light in terms of bass response. But all’s right with the world at moderate and louder listening levels, with the Uniti Nova’s amplifier driving the speakers at the 50 to 80 range on its 0-to-100 volume scale. Above 80, honestly, the hard walls in my medium-sized family room became a limiting factor. Your mileage may vary, of course; especially if you have a larger or better-damped listening space. Circling back to the ultra-modern design of the Concept 300’s stands for just a moment: Sure, that suspension-bridge styling can be off-putting if you’re not into the black-leather-and-chrome furnishings those stands so naturally complement. I say give ‘em a listen, if they’re within your budget. I think you’ll conclude their performance overrules everything else. I’ve already decided they look perfectly wonderful on my raggedy 1850-vintage southern-pine floors. In a world of look-alike loudspeakers, Q Acoustics’ high-end Concept 300 stand apart—and sound awesome.